A sophisticated formula parser offers the possibility to combine simulation results in multiple ways to derive user defined results. The feature of User Defined Results opens the path to perform constrained optimization by adding the constraint condition as a penalty function to the original function one is optimizing. 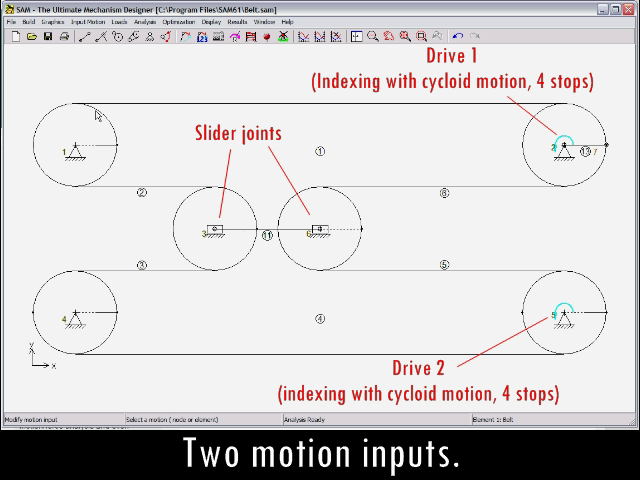 The calculation of bearing forces in joints is now equally easy for fixed and for moving joints. In previous versions of SAM the calculation of bearing forces in moving joints required manual steps, which have been eliminated. New transformation (mirror, translation, rotation, ..) and grouping commands have been added that allow the user to easily modify elements/mechanisms but also graphical items. The new licensing system supports node-locked licenses and floating licenses. It is a two-step approach in which customers first receive an activation ticket. During the activation process, which requires internet access to send information to our central license manager, the final license will be generated and send to the customer. In order to better meet the needs of our customers we have introduced the concept of ANNUAL LICENSES next to the already existing PERPETUAL LICENSES. It is now possible to obtain an annual license without any entry fee or obligation to continue after one year. Neither is there any automatic continuation of the license period. An annual license is always based on the latest available version of the software, so you are always up-to-date. Simulation using belts and chains added. Go to our Youtube channel. "Division by zero" crash in case the Snap-To-Coordinate grid size is accidentally equal to zero in Preferences > Mouse > Mouse Snap. Error message "Synchronisation of motions and/or loads not correct", while the tolerance limits under Preferences>Analysis>Solver Options are such that the deviations are smaller than the tolerance and the analysis should have been carried out. What's new in SAM 6.0? Taking the initial design/topology as a starting point one can for example further improve the quality in which the trajectory of a coupler point equals the target trajectory by changing the geometry of the mechanism within pre-defined ranges. Or one can minimize the peak or RMS value of the driving torque of a mechanism by adding a compensating mass and let SAM determine the optimal value of the mass and its position within the allowable range. Just as in the case of the trajectory optimization one can also specify a reference function and minimize the difference between the actual and the reference function. When designing for example fitness equipment one is generally seeking a predefined force as function of displacement. In previous versions of SAM the user interaction model was based on "Select action from menu or toolbar, then select item to apply action to", for example Delete Element followed by a selection of the element to be deleted. Many programs, such as Microsoft Office, use a different approach which is based on "Select an item and press right mouse key to see which actions can be applied to the selected item". In order to satisfy both experienced SAM users and novice users which are used to the Microsoft Office approach, SAM 6.0 supports both user interaction approaches. SAM makes your mechanism course more lively and your practical exercises more fun for your students and less work for you. At the end, this leads to improved knowledge transfer, motivated students and higher grades. Mechanism design is just one of many challenges you have to face. It is important that the toold you are using are easy and intuitive. Most of SAM's development staff has a mechanical design background, so SAM understands your needs! With SAM you can tackle any mechanism design challenge, perform motion/force analysis and even improve the initial design with state-of-the-art optimization based on a mixed evolutionary algorithm and Simplex approach. What do the users say ? "SAM has become an important tool in my daily engineering practice." "... straight forward, comprehensive and very effective." "No unnecessary and confusing features." What do the journals say? "SAM is a very useful mechanism design program ..., the price can't be the problem !" "SAM is a robust and versatile software program with an excellent user-interface, which makes the program very easy to operate"
Copyright 2012 BIIX Mechanization Co., Ltd. All rights reserved. Picture Window theme. Powered by Blogger.